The town of Hartford, VT had a tough decision to make. 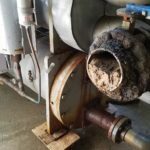 Having spent redevelopment monies a few years ago on the front-of-the-house architectural and access issues they were now faced with the challenge of a refrigeration system in a severe state of rot. 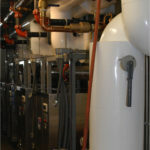 Initially the town negated spending any monies on the failing commercial Carrier unit used as the refrigeration plant. In addition to the brine eating this unit, the seasonal arena also had a water cooled plant with a cooling tower in deplorable condition. 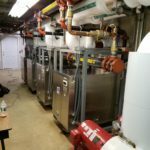 Vermont Commercial Refrigeration, the rink service vendor, came to Emerald Environmental Technologies to see if ice3 Cubes could be a fit for this facility and their upgrading goals as time progressed. 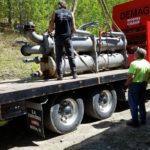 The water treatment of cooling towers was something that the rink wanted to eliminate as well as maintenance associated with the water cooled plant. The refrigeration room is extremely small, having been built around the commercial Carrier unit, so removing the old system would require removing a wall. The systems brine solution produced congealed and congested piping which needed to be replaced. 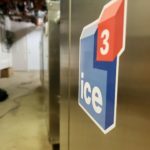 A preliminary drawing was produced and custom support stands were proposed to fit the 84 Tons of refrigeration within the four ice3 Cubes. 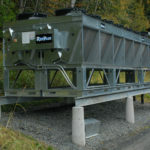 In addition, the design incorporated a fourteen fan V-Coil dry cooler across the fire lane with underground piping and electrical, eliminating the need for the water cooling tower. A short circuit antifreeze pump design was proposed to allow for protection of glycol below 0°F outdoor conditions. 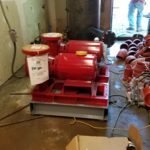 The town’s public works department found a use for the old Brine solution, so it was recaptured for their use eliminating the need to dispose of the solution. The system was then thoroughly flushed with water and tested by laboratories prior to introduction of glycol. In an effort to produce functionality of the facility in the future, a decoupler on the cold part of the system was proposed to allow for varying flow rates through the cold floor versus the ice3 Cubes. Future air conditioning connections on the decoupler were proposed for future potential of a multi-use facility in the summer. 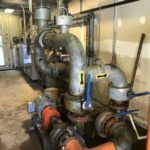 On the warm side, piping connections were proposed to recapture, what would be, waste heat from the plant to utilize in other areas of the facility during future changes or expansion. A Digital Control System was proposed to allow energy management of the plant as well as remote alarming capabilities and future reclamation of heating energy. 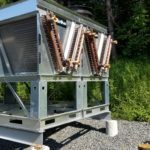 The four ice3 Cube System with dry cooler and ability for future HVAC connections are completed. 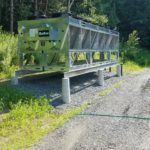 The cooling tower was removed and the dry cooler was relocated across the fire road allowing for the space to be recaptured and built out for storage. The dry coolers remove excess heat (above what can be used in reclaim heat usage) and releases the heat in the form of steam into the air. This allows more cost saving by removing the need to treat the water as it is drained from the system. 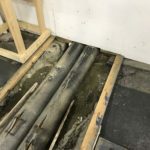 Typically, if the additional heat is removed in the form of water, the water and the system responsible for removal must be treated to prevent mold and other issues associated with water collection. 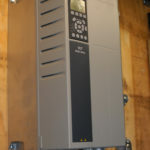 By removing the heat via steam, we illiminate the cost of an outside company treating the water, the need for additional chemicals (used to protect against mold and other issues commonly found with moisture such as Legionnaires’ disease), and avoiding introducing those water treatment chemicals into the environment. The brine system has been converted to glycol and we anticipate a much more efficient system. 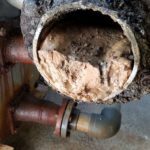 Upon initial inspection, a massive corrosion was evident in the original brine system partially blocking heat exchangers. All new digital controls will be installed allowing long-distance monitoring and most importantly, the ability to feed the system the correct horse power for the actual needs of the facility. Digital Control capabilities not only allow operators to easily shift gears for different activities but also ensure that the refrigeration system is operating at its peak efficiency. In addition, the plant will be built to allow flexibility should the facility grow its programs to the point that more ice3 Cubes are required then “plugging into the system” will be a non-event. By prepping the new upgrade to allow additional ice3 Cubes if needed, Emerald saves the facility time and money. 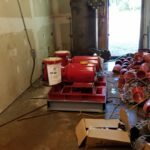 The brine was eating this unit, the seasonal arena also had a water cooled plant with a cooling tower in deplorable condition. 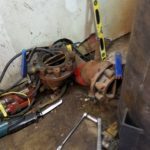 The refrigeration room is extremely small, having been built around the commercial Carrier unit, so removing the old system required removing a wall. 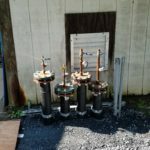 The systems brine solution produced congealed and congested piping which needed to be replaced. Underground piping and wiring to be connected to copper connections on the dry cooler. The unit is elevated on concrete piers and galvanized I Beams. 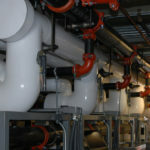 All underground and above ground is plastic and copper piping. Underground piping at the building is piped under the fire lane. The space adjoining this is where the water tower sat. The town is installing an enclosure around the concrete pad with a roof and is gaining this space as storage. Piping connections to the cold floor, these are the only items left from the old system. The dry cooler is set across the fire lane. No water is a perfect solution for a seasonal rink. Really small room only 8 feet wide. Custom cube stands will fit perfectly. 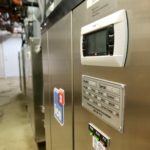 Digital control capabilities not only allow operators to easily shift gears for different activities but also ensure that the refrigeration system is operating at its peak efficiency. The dry coolers remove excess heat (above what can be used in reclaim heat usage) and releases the heat in the form of steam into the air. This allows more cost saving by removing the need to treat the water as it is drained from the system. The mechanical room is completed – neat and tidy. The digital control system, standard on every ice3Cube, is seen here.